Young Dr. Horrible Artist Trading Card Front. "This is an ATC, or Artist Trading Card. It is a miniture piece of art done most commonly, as this one is, on a playing card. It measures 2 x 3 inches (I'm sure it will appear larger in the graphic).". HD Wallpaper and background images in the Dr. Horrible's Sing-A-Long Blog club tagged: dr. horrible's sing-along blog image dr. horrible fanart artist trading card trading card. 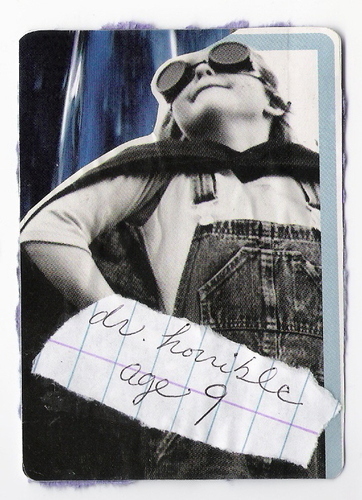 This Dr. Horrible's Sing-A-Long Blog fan art might contain newspaper, paper, magazine, tabloid, and rag.